Engineered Wood is composed of multiple layers of natural wood stacked one on top of the other. It usually comprises of three layers. The two lower layers are of softwood and the topmost layer is a veneer of 3-5mm authentic hardwood species. Because of the inherent nature of solid wood flooring, engineered wood has become a more common choice and better suited to humid and tropical conditions, as it has a higher level of moisture resistance. The engineered wood is processed and treated so that it has minimal expansion and contraction during various seasons. 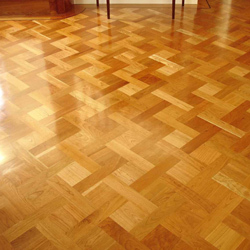 It is the most common type of wood flooring used globally. 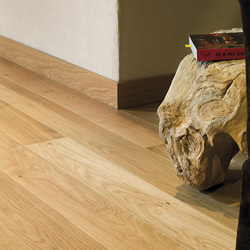 Our range of engineered wood flooring comes in Single Strips and 3-Strip planks, comprising of the following species: Oak, Maple, Merbau and Walnut. Solid Wood, which essentially is real hardwood, is made of planks milled from a single piece of timber. Solid Wood provide a touch of elegance to your office and your home environment and it is rapidly becoming a choice of homeowners, particularly because of it's inherent aesthetic qualities. We provide the largest variety of natural wood species, available in different surface textures and finishes. The number of hardwood species available at Galeecha has significantly grown over the years and also includes certain exotic species from around the world, including different types of Oaks in natural finishes and numerous dyes, Walnut, Maple, Ipe, Merbau, etc, in matt and gloss finishes. Our hard wood flooring are sourced from certified forest, which maintain ecological balance and wood logging is done in a sustainable method. 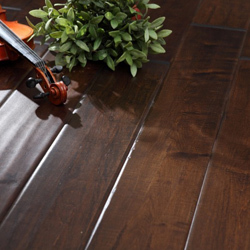 It has excellent value when compared to other flooring products. Laminate flooring is a multi-layer synthetic flooring fused together with a lamination process. 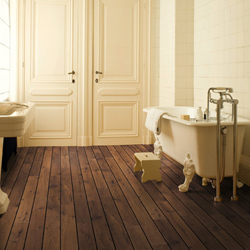 Laminate flooring imitates various wood species with a photographic sheet under a clear protective layer. The inner core layer is usually composed of melamine resin and fiber board materials. 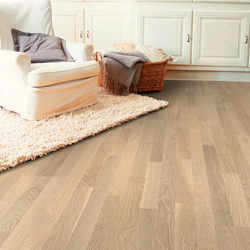 Laminate flooring is a very popular option because it is easier to install and maintain than natural wood surfaces. It also has the advantages of costing less and is reasonably durable, hygienic and easy to maintain. Deck Wood nowadays are being made from a composite material that is a mixture of wood fiber, plastic, and some type of binding agent. These ingredients are put together to form a material that is denser, stronger, and heavier than wood, forming a wood-plastic composite. Deckwood or outdoor wood is also made from natural pressure treated teak, mahogany, or redwood. We offer both types of outdoor woods.